I beat myself up A LOT. I nitpick everything I’m doing wrong as a mom, and I compare myself to others… and maybe you do too. But not today, friends. My sweet friend Chelsea from And Then Life Blog nominated me to share 10 ways I’m rocking motherhood. This task was difficult at first, but as I thought more about it, I realized I AM rocking motherhood, and it’s all truthfully because of one BIG reason that opened my eyes to all the positives in my life as a mom. The number one reason I’m rocking motherhood is because God is my help! I have a heavenly Father who teaches me through His Word how to parent most effectively and how to love unconditionally. He provides patience for the intolerable days and grace for the insufficient days. I pray for and with my kids. They love our prayerful moments together just before they drift off to sleep each night. I wish I could record each prayer they pray because they teach me so much about faith and thankfulness as they pour their hearts out to God. I’m so glad this has become our nightly routine, and I know it has made such a difference in how I parent them and in how they react to me. Prayer helps me rock motherhood for sure! I get down on the floor and play with my kids. Sometimes I even ignore the aftermath of the tornado that apparently crashed through my house just to spend five more minutes tickling, wrestling, and cuddling with my munchkins. I try to fight my OCD tendencies just to be present in the moment with them and treasure those fleeting times before they no longer desire to roll around on the floor with me. I have learned to let things go. This point ties into my previous one but takes it a step further. Not only have I learned to ease up on my obsession with the house being spotless, but I have learned to be more laid back with my children at play time. It’s okay to allow my kids to be kids every once in a while, being loud and rambunctious and energetic. Yes, I teach them when it’s not appropriate to do so, but sometimes the best thing I can do for them is loosen the reins and let them be downright silly. I allow “lazy” days. When the kids are sick or I’m not feeling well or we are all just exhausted for whatever reason, I pop in movies and we lounge guilt free. All. Day. Long. Of course, it’s great to have a schedule for kids packed with educational activities and exercise to stir up their minds and keep them healthy and active, but some days we all just need to rest… for my own sanity and their good. I take these days of rest when we need it and don’t regret it at all. I give hugs more than I discipline. Disclaimer: that doesn’t mean I don’t discipline often because I do! I love my kids (and their daddy) more than anything in this world, and I want my actions to demonstrate that I do. So, with much needed discipline comes a balance of grace and hugs. Even on the terrible days when my children are at their worst and I’m constantly disciplining with few breaks in between, I still attempt to squeeze them tightly and love on them just as much as I frustratingly shout “no” for the billionth time. I refuse to be the angry mom all the time. I say, “I’m sorry.” I realize that I am not always right. Sometimes I am dead wrong in how I handle my kids, and I have learned to admit those mistakes to my children. I set aside my pride and the need to always be right in order to be honest with my children. I challenge my children. Since I refuse to raise up “I can’t people,” I don’t come to the rescue every time a feat seems too difficult for them. I push them to try their best and to practice until they finally overcome. It’s not easy through the tears but is so worth it, knowing this will make them stronger, more confident, and more capable to venture out on their own one day. I adjust my parenting/disciplining strategies based on each child’s individual needs. After having three children, I have learned one crucial thing: every child is different, so every child should be treated as such. I do my best to learn what makes my children tick—what makes them feel happy, sad, scared, loved, safe, and secure. I teach Jesus to them in all circumstances, both big and small. My number one goal in parenting is to point my children to Christ. I pray that they’ll realize at an early age how crucial knowing God is and that they will surrender their lives to Him. When they do something wrong, I explain why it’s wrong according to God’s own words straight from Scripture. When something good happens, I explain that it’s a blessing from God. I always point them to Christ! The truth is, I couldn’t rock motherhood on my own. God has provided me with wisdom and grace and love so that I can handle anything this mom life hurls at me. And with His help so can you! Ally of You Are More Blog, Amy from The Gilded Wife, and Quinn from Sanctification and Spitup to post 10 ways they are rocking motherhood too! You are rocking motherhood!! This is a great reminder and prompt for us to realize we are doing good even on our hard days. Thank you! And yes, hard days just come with the territory! Aww thank you so much for nominating me, Chels! Love it! I definitely need God to give me bravery and wisdom and grace. And we’re doing a lazy day today! It’s needed. Yes! Lazy days are just necessary! I hope you enjoyed it! You ARE seriously rocking motherhood and I couldn’t agree more with your list, Steph 🙂 I’m just learning how important #9 is and how important it is to approach each child differently, in more ways than one. Jesus has always been the answer and my go-to for guidance 😉 You’re doing amazing, mama! If Jesus is your go-to, then you are most definitely rocking motherhood too! Thank you, friend! I love this!! 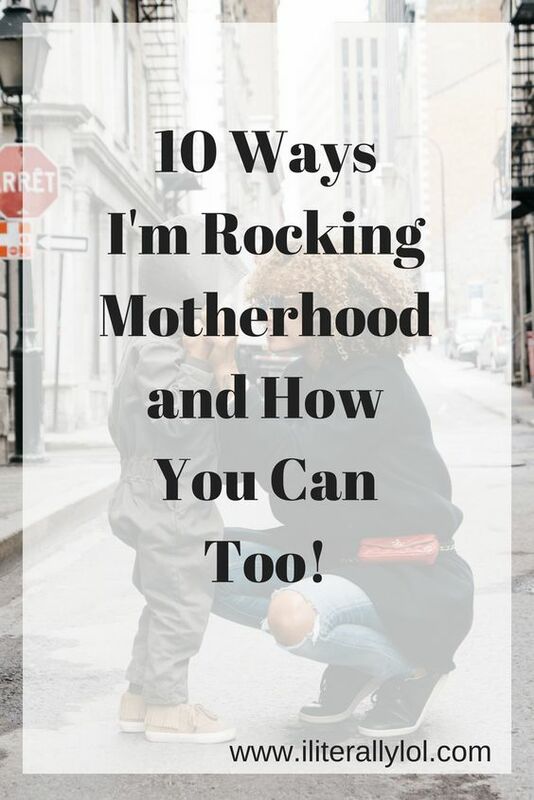 You are totally rocking motherhood! So many good things to remember! I love this list.